Hey. Welcome to wordpress and the rest of the blogsphere outside of Windows Live!! This is “the wordsmith”, “joelle blackstarr”. Time to reconnect. Peace. dude, you are really liking this place, I see you have Christopher Reeve on here now. What a co-winky-dink, in a class that I am taking my professor was just talking about how when she meet him to for a book signing. Yeah I am doing my best to figure it out. I saw this pic of Christopher Reeve and I knew I had to have it on my blog. I always said if there were two people I always wanted to meet it would have been Sammy Davis Jr and Reeve. Hope you are well my friend. dude you are putting in some work on this blog…your profile pic, the background, the header, dang…you really doing your thing. Peace. Happy Holidays to you as well bruh. Is that a pic of you standing near the white house (on the side bar)? It is. 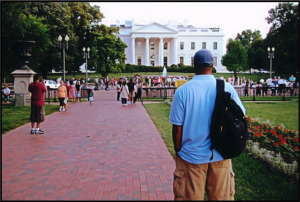 I’ve always wanted a picture in front of the White House and I was lucky that day because there weren’t that many people visiting that day. It made it easier to take the picture. I actually have it framed in my room. Wishing you a Happy New Year as well!!!!!!!!!! !